Over the past few months I have been swamped with emails from people panicking over the economy and wondering how they’re going to cope with it. Many people believe that government regulations, bail outs and other schemes will help them to succeed. There are those who feel that if there were lower food and petrol prices it would help to turn things around. Still others blame the economy, taxes, the war in Iraq and countless other factors. The road to financial success and prosperity starts in your own mind. Why is this important? The answer is simple, but profound. Energy flows to where attention goes. Regardless of what type of business you are in or choose to go into, what you focus on will have greatest impact on your business. Now more than ever, it’s important to realize that YOU and YOU ALONE hold the key to YOUR financial success. In the grand scheme of things, it doesn’t really matter what happens to other businesses or how they are affected by the economy. The only thing that matters is what happens inside of YOU. The fact is, you can still earn a LOT of money and enjoy a wonderful lifestyle regardless of what’s happening in the economy. All it takes is focus, the proper resources, and realizing your power to succeed comes from your Rich Mindset. Your personal power is also dissipated when you listen to the news, especially the economic news. Now, I’m not saying to ignore economic and financial news. That would be irresponsible. What I am saying is don’t let it influence your outlook on what is and isn’t possible for you and your business. For many people, bad economic news is a self-fulfilling prophesy. It gives them an excuse to fail instead of focusing on opportunities to succeed. Aside from the cold, hard statistical facts, most of the people you hear on the TV and radio who are discussing the economy are expressing their opinions. They are not FACTS, only opinions. These people, and the organizations behind them, make money and get high ratings by ’selling’ you BAD NEWS. For example, some so-called ‘experts’ are comparing the current U.S and world economy to the Great Depression of the 1930’s. That’s just an opinion. It is not FACT. Unfortunately, this type of limited and scarcity thinking will give MILLIONS of people the excuse to do …NOTHING. For many, it will become a self-fulfilling prophecy. The bad news will permeate their subconscious mind and cause them to ’see’ limitation instead of opportunity. An opinion doesn’t turn into prophesy unless you let it! I rarely watch the news anymore. I simply REFUSE to listen to it or watch it. I recommend you do the same. It’s POISON. Most people are ADDICTED to doom and gloom news. It’s hard to avoid since it’s fed to us every single day by the media. But the question is: are you going to be just like the rest of the crowd? One of the keys to success is to do the opposite of what the crowd is doing. Warren Buffet became the richest person in the US by doing only one thing: he buys shares when others are selling and he sells shares when others are buying. In other words, he does the opposite of the crowd. Here is the real secret – regardless of the economy, opportunities are always available to turn our ideas into cash. The FACT is, you are ONE IDEA away from your greatest opportunity, regardless of your personal financial situation or the economic climate. One idea. That’s all it takes. Circumstances may “appear” tougher during uncertain economic times, but in reality, there is never a shortage of opportunities to succeed. There is a natural, rhythmic order of things. Everything you can see, hear or touch; everything you can sense is subject to the natural law of cycles. The fact is that the flow of money is governed by natural laws. The entire universe is subject to the Law of Cycles. Money is no exception. The flow of money never ceases. Instead, there’s only a natural shift in the opportunities required to create it. 2. You need to be aware of and act on any new opportunities presented to you. Despite the economy many people are still making a lot of money. There’s no reason why you can’t be one of them. If one of your goals in life is to achieve wealth and financial independence, one of the quickest and surest ways to achieve those results is through owning a business of your own. Period. Believe it or not, a recession can actually be a wonderful time to start a new business venture. I can tell you right now that some of the most profitable businesses were started during “bad” economic times. The owners simply addressed a need during an economic downturn which continued to be successful even when the economy rebounded. Starting a business in a recession is like vacationing in the off-season. It’s a little less crowded, and you can get a lot more for your money. It allows you to tap into new markets and launch new products that will serve the needs of the current economy and build a business for the future. During tough times, it’s easy to get into the habit of thinking negative thoughts and making negative comments. Constantly thinking and talking about what is wrong with your life, your business or the economy will only serve to bring you more of what you focus on. Before you know it, you’ll end up in one of those self-fulfilling prophecies we talked about earlier. Stay informed, but don’t keep repeating what you hear on the news. Remember, energy flows to where attention goes. By focusing on what you want instead of what you don’t want, you’ll also do wonders for your creative thinking. Creative thinking allows you to come up with solutions to your problems. It also allows you to see new opportunities. One of the biggest downsides to being in a negative frame of mind and focusing on what you don’t want is that it blinds you to opportunities. Investing in yourself is more secure and more rewarding than owning stocks, bonds or real estate. Moneymaking ideas are gifts that most people ignore. However, if you act fast on them, you can prosper fast. Don’t simply entrust your money to others. Invest in yourself, have faith in your ideas and take control of your financial future. The more you expand your awareness and education, the more you can see the opportunities to make more money. The more you invest in yourself – the better the return you’ll get when you take action on what you learned. The choice is always yours. Are you going to focus on scarcity or the lack of something or are you going to focus on creating more of what you want? These are your only two options. Instead of focusing on cutting back and spending less, change your point of focus to create MORE of what you want. Use that same creative energy to attract the things you desire and to improve your life and your business. If you really take stock of all the things you do have in your life, I bet you will be amazed. Every so often someone will write to me and tell me how desperate things are for them. Since I’ve been there myself at one time, I can surely sympathize. How bad is it – really? For example, how bad can it really be if you have enough to eat today? Many people around the world have had nothing to eat in days…. How bad can it really be if you are sitting at a computer and writing me an email? Some people around the world don’t even have electricity to run a computer, let alone own a computer. Ask yourself: how bad is it – really? As difficult as you current situation may be, it is only temporary. There are millions of people all around the world who would trade places with you in a heartbeat. The good news is that if your life or business is stuck right now, it is a warning that your point of focus in going in the wrong direction. The enlightening secret is that this pattern can be easily shifted by simply refocusing your awareness OFF of “I don’t have enough” and ON to feelings of gratitude and appreciation. This vibrational inner shift causes you to physically attract more business and more income from sources that may have not been apparent to you before. Even though you may have been struggling financially for many months or years, it really does not matter. You can instantly shift into the experience by refocusing your attention on deep feelings of appreciation and gratitude. Choose to focus on ANYTHING that you can authentically feel deep gratitude for. With patience, you will soon begin to see these physical manifestations of abundance come your way. Consistent gratitude is the easiest track to ending poverty internally and externally. When your abundance is measured by how deeply you FEEL grateful for what you already have and how often you visit this feeling, then your experience of attracting riches is truly unstoppable. This is the most direct path to financially magnetizing massive abundance to you. Focusing on what you have will cause you to feel grateful. And when you feel grateful, you automatically place yourself in alignment for more good things to come into your life. It also opens the doorway to your mind. Only when it’s open, can opportunity jump in. Remember, the road to abundance and prosperity begins in your own mind. Money is unlimited because your mind is unlimited. Stay focused on opportunity. Because at the end of the day, it’s not the financial “experts” or politicians who are ultimately responsible for your financial situation now or in the future – it’s you and you alone. Listen, I am NOT just a positive thinker. 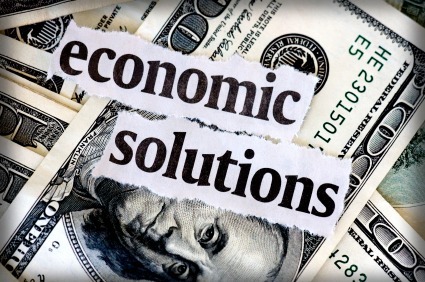 I’m a REALIST and the reality is that, yes…there ARE indeed some economic challenges that we ALL have to deal with….. Some businesses are going through a hard time and need to adjust. We ALL go through these things at one point or another. It’s part of the natural cycle of things. But here are some more FACTS…. History shows that people can prosper even in the worse economic downturn. Thousands of new millionaires were made during the “Great Depression”. There is never a shortage of new ideas so there is never a shortage of opportunities. Thousands new businesses will be started in the next 12 months and these business owners will make a fortune. The Internet has opened up the world to a whole new realm of possibilities. Ordinary people can now turn side businesses into lucrative money-making ventures like never before. Do you get the point? It all depends on where you FOCUS YOUR ATTENTION! There really ARE no limits. Possibilities are endless and everywhere…oftentimes right under our own noses. The key is you cannot follow the crowd. You have to zig, while others zag. What can you do today, better and more profitably than yesterday? All it takes is one simple idea to transform a life of mediocrity into one of GREATNESS. And whatever you think you can do – start taking some ACTION right NOW, even if it is just one small step. Your words become your habits. Your habits become your actions. Your actions becomes your destiny. We’re living in interesting times. You can prosper beyond what you think is possible. The question is: What will you do differently? Dr. Robert Anthony is the author of 15 books which have sold over 10 million copies. He is recognized as the world’s foremost Law of Attraction expert, an inspiration behind the making of The Secret and consultant to major corporations such as FedEx.